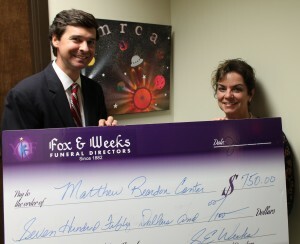 Fox & Weeks Funeral Directors presented a $750 York Children’s Foundation grant to the Matthew Reardon Center for Autism in July that will help pay special lighting in the Foundation’s classrooms. Each time a family purchases a casket at Fox & Weeks, a portion of the cost is donated to the York Children’s Foundation in the name of the deceased and the accumulated funds are distributed quarterly through an application process to area non-profits benefiting children and children’s causes. Fox & Weeks has now awarded more nearly $20,000 in York Children’s Foundation grants since 2012. The Matthew Reardon Center for Autism is dedicated to the care and education of children with Autism Spectrum Disorders. Through partnerships with existing medical, educational and community services, MRC provides special programs to enhance the quality of life for these children, and the Advance Academy at MRC Our is an accredited program designed to provide students with ASD the opportunity to reach their full academic potential. The York Children’s Foundation is affiliated with the Mathews International Corporation casket division and has delivered millions of dollars in grants throughout the country since its introduction in the early 1990s. Fox & Weeks is the only funeral home in the area actively participating in the York Children’s Foundation program. Any organization in the Coastal Empire with the primary purpose of providing for children’s needs is eligible to apply for a York Children’s Foundation grant. To qualify for a York Children’s Foundation grant through Fox & Weeks, an application must be submitted and an organization’s activities must be primarily directed towards the welfare and benefit of children.